This fabulous dinner at the Four Seasons Restaurant with a dear friend provided a great opportunity to check in on three Barolos from Cappellano. The Four Seasons remains a Manhattan institution. By day, the Grill Room and the Pool Room play host to a who’s who in the worlds of finance, entertainment and business. At night, the Pool Room, with its large, central illuminated pool, becomes one of the most evocative and romantic dining rooms in the city. Even after all these years the late 1950s design by Philip Johnson and Mies van der Rohe is a model of timeless elegance and beauty. 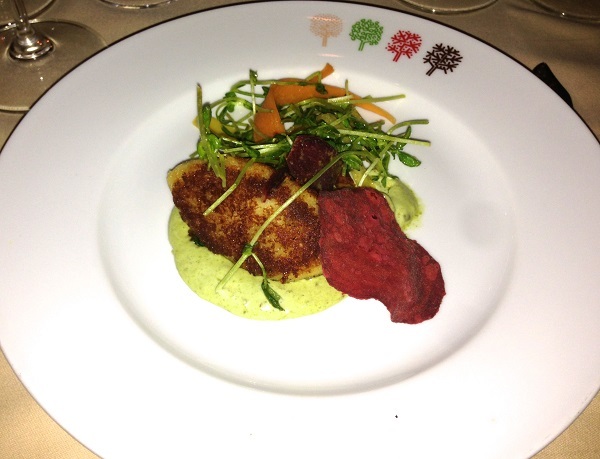 The food at the Four Seasons is best described as American with a few international accents. Our dinner is fabulous. The crudo tasting and burrata are delicious and light starters. My favorite dishes on this night are the Maryland crab cakes, a signature dish of simplicity and pure deliciousness, and the filet mignon, which is superb. 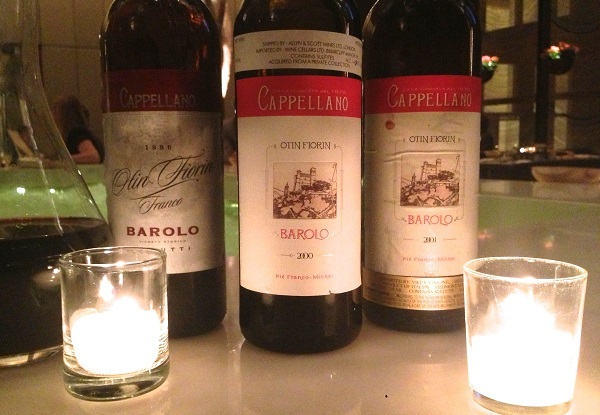 Three Barolos from Cappellano pair beautifully with the food. Cappellano makes two Barolos from the Gabutti vineyard in Serralunga. Both are made along rigorously traditional lines. The Barolo Rupestris emerges from a parcel planted on American rootstock. It is generally a rich, ample wine with notable depth and density. Cappellano’s Barolo Pie Franco, from own-rooted Michet clones that form very loose bunches, is much more aromatic and beguiling in style. When I first started visiting the estate in the early 2000s and writing about the wines in Piedmont Report, Cappellano was virtually unknown except to a small circle of hard-core Piedmont devotees. The Barolos were readily available and priced far below most peers. A few years later I moved to New York, where mid-1990s vintages could be found for $30-40. I remember paying $100 a bottle for the 1978. Those days are long gone. Today, the Barolos, especially the Pie Franco, is virtually impossible to find, even in Alba’s wine shops. The 2000 Barolo Pie Franco lifts from the glass with exquisite aromatics and bright red fruit. Soft, enveloping and silky on the palate, the 2000 captures the best qualities of this warm vintage. Although it is quite beautiful today, the 2000 is quite fresh for the year and has enough depth to drink well for at least another decade. The lighter, airy texture is a perfect match for our first courses. From the moment it is opened, the 2001 Barolo Pie Franco is utterly captivating. Here the flavors are broad, rich and intense, with the verticality of a skyscraper and a complex personality that continues to develop over several hours. With air, the 2001 can be enjoyed today, but readers who want to experience the full range of Barolo aromatics will want to hold on to bottles for a few more years. What a beautiful wine this is. The 1996 Barolo Pie Franco is another beast entirely. Deeply colored and intense on the palate, the 1996 has a level of hoisin-like concentration that reminds me of the 1978. At the same time, though, the aromatics are slightly oxidized and suggest less than perfectly clean barrels. In that sense, the 1996 is an old-school Barolo, in both the positive and negative. While all three wines are delicious, the vintage I would seek out most is 2001, as it has another two decades or more of brilliant drinking ahead of it.